Repealing the ACA means undoing numerous protections for the American people and will leave millions of Americans uninsured and in poor health. Tell Senators Ron Johnson and Tammy Baldwin that this is unacceptable. MADISON - The national League of Women Voters has issued this Action Alert to defend our LWV public policy position in support of a health care system that provides access to a basic level of quality care for all U.S. residents and controls health care costs. Today the U.S. Senate convenes for the start of the 115th session of Congress. It's a day full of celebration, ceremony and new beginnings. But the Senate leadership is expected to take their first official action to fully repeal the Affordable Care Act (ACA). Repeal of the ACA will leave millions of Americans uninsured and in poor health. Tell Senators Ron Johnson and Tammy Baldwin that this is unacceptable. Repealing the ACA means undoing numerous protections for the American people. These include a guarantee that pre-existing conditions can't be used as a reason to deny coverage and allowing young adults to remain on their parents' insurance plan until age 26. They also include coverage of preventive care, limits on out-of-pocket costs, and a prohibition on life-time insurance caps. The ACA ensures that women can no longer be charged more for health care than men. We fought hard for these rights and protections -- going backwards is not in the country's best interest. 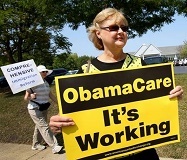 The passage of the ACA, commonly referred to as Obamacare, in 2010 was a major victory for the LWV. The League is committed to ensuring that Americans have the coverage and access to care that they need. State and local Leagues have continued to work with government agencies to implement the ACA in communities across the country. The League will not stand by while members of Congress dismantle protections for the health and well-being of the American public. Our support is needed to assure that those who have been left without health care should not have this happen again. Tell Senators Baldwin and Johnson to oppose efforts to weaken or repeal the Affordable Care Act.